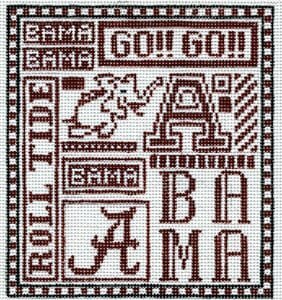 This U of Alabama needlepoint canvas is 5" x 5" on 18 mesh. You can purchase this college football needlepoint design canvas-only or with your choice of fibers - see the drop down menu for options and prices. The cotton is DMC floss; wool is Bella Lusso; Silk is Planet Earth Pepperpot. If you require stretcher bars we recommend two pair of 9". For questions about this licensed Baylor College football needlepoint design please contact us. We are always glad to help.